With each tower having a height of 221 feet, weighing 104 tons and with129 foot long blades, the Hopkins Ridge Wind Project has the largest wind towers in Washington State. 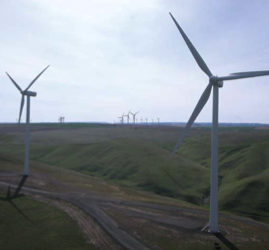 The 83 wind towers making up the project are dotted across 11,000 acres of farmland in southeast Washington. 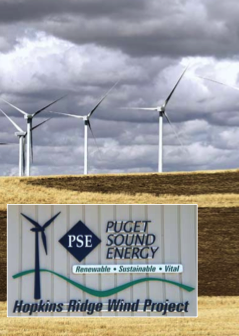 Washington's Puget Sound Energy is adding wind farms to its energy generation portfolio, but doing so in a different way for a utility company in that it actually owns the new $200 million, 150 Mw Hopkins Ridge wind power facility. Wind power is among the fastest growing sources of energy generation in the world. In the U.S. alone, wind generation has grown at a staggering 24 percent per year pace over the last five years. And although there are only 1.6 million homes powered with wind today, it's estimated that number will grow to 25 million homes by 2020. With those kinds of statistics, there will be more wind towers, like the 83 that are now dotted across 11,000 acres of farmland near Dayton, in southeast Washington State. At a distance they look delicate--the blades slowly rotating as they generate energy for Seattle and the Puget Sound area. But each tower is 221 feet high, weighs 104 tons, with blades 129 feet long. They are the largest wind towers in the state and form the 150 megawatt Hopkins Ridge Project. Hopkins Ridge is a new piece of the Puget Sound Energy (PSE) portfolio. It's less than a year old and each turbine generates 1.8 megawatts. The entire project generates enough energy to supply approximately 50,000 homes.The successful project is just a part of forward-thinking PSE's plan to service five percent of its customers' energy needs with renewable sources by 2013. "The renewable energy goal became corporate policy in 2003," explains Roger Garratt, PSE's director of resource acquisition. PSE filed its request for proposals (RFP) in late 2003, and it was open to any generation source. "We received a number of proposals, and after evaluating them all, the wind projects had the least costs by quite a margin," he says. Hopkins Ridge stood out as an ideal project. Renewable Energy Systems (RES), a company based in Austin, Texas, had been working on the project for a few years. It had entered into lease agreements with the landowners. They had also done the necessary environmental studies and permitting, as well as made arrangements with Vestas, a Danish company, for the turbines. "Normally, companies such as RES develop a project like this and then sell the power to a utility company under a wholesale power contract," explains Garratt. "But in our RFP process we asked people to quote to us based on a wholesale power agreement as well as selling us the project. We found that in every case, it was more economical for our customers for us to own the project versus purchasing the power." Before considering a purchase, PSE did extensive research. Among other things, the company looked at how it would integrate wind power into its existing system by talking with other electric utilities and those involved in other projects. They also sought input from outside resources like 3Tier in Seattle, that examined long-term weather patterns to ensure sustainable winds. And during the construction phase, another company, Global Energy Concepts, reviewed the designs. "We knew what the challenges were," says Garratt. "And we knew that we could handle them before we went ahead." Once the decision was made to buy the project, RES sold PSE the development rights and assigned them all leases and permits. PSE then turned around and hired RES to handle the construction. Eight months later, in November 2005, the wind farm was operational. "Construction was actually fairly simple as far as construction projects go," says Garratt. "There are a handful of different contractors that are building projects like this around the Northwest, and they are quite experienced and have become fairly specialized. I think the repetitive nature of the work helps build that experience." Also helping speed up construction was the modular nature of the equipment. The wind turbines come in three sections--the hub, blades and nose cone--and come fully assembled. The biggest challenge of construction was sequencing the events. First, 53 miles of roads were laid by subcontractor Jerry Herling out of California. Around the same time, Herling also started trenching for the 93 miles of cables that would connect the turbines. Next came Dressel Enterprises, which excavated and constructed the foundations needed for the towers. Foundations were a critical piece of the construction process. Because of the rocky soil at the site, subcontractors had to first blast out a hole. Backhoes dug until the hole was approximately 30 feet deep and then a combination of canisters (resembling culverts set up on end), 28-foot anchor bolts, 100 to 260 cubic yards of concrete, and excavated materials, were used to create each base. The last step was the towers. "Although the turbine manufacturer, Vestas, is Danish they use outside vendors to manufacture towers. So the towers came by way of Korea, Vietnam and Canada," says Garratt. "RES used one crane to lift the bottom two sections of the tower, and then brought in a larger crane for the top section. A third crane was used to put on the V80 turbines, then the blades, one at a time," he explains. "Because this is also an assembly line process, the challenge was more of traffic management. The equipment is so big and it all has to be staged in a way so it's not going to get in the way of somebody else." And throughout it all, there was continued communication with farmers about the impacts the construction would have, especially since the construction coincided with harvest. In addition to talking with other utilities to see how they integrated wind power into their systems, Puget Sound Energy also sought input from outside resources, like 3Tier of Seattle. 3Tier examined long-term weather patterns to ensure sustainable winds for the Hopkins Ridge Wind Project. At the end of construction, the towers seemed to be scattered across the fields. Garratt agrees: "To someone not involved with the project, they might look like we threw darts at a board, but each spot was carefully chosen and the turbines lined up perpendicular to the prevailing wind direction." The blades move at a leisurely 17 rpm. A gear inside the cell takes that slow speed and speeds it up for the generator. One of the V80's important features is its OptiTip pitch regulation system, which ensures a continuous adjustment to maintain optimal blade angles in relation to prevailing wind. And it keeps sound levels within the limits of stipulated local regulations. Garratt explains how it works: "The blades have a 'cut-in speed' of four meters per second (mps)--below which, the turbine produces no electricity. Between four and 15 mps, the machine ramps up, operating at its maximum 1.8 megawatt rating at 15 mps. Above 15 mps, the blades pitch to maintain a power output of 1.8 megawatts, until the wind speed reaches a 'cut-out speed' of 25 mps. At that point, the blades are fully pitched and the unit shuts down to protect itself from high winds." Improvements like these are evidence of a turbine industry that has matured significantly in the last 10 years, says Garratt. Companies like Vestas have focused on their larger machines and making them more efficient. Between 1981 to 2002 turbines have gone from generating 55 kilowatts to 2,000 to 3,000 kilowatts. The turbines have also become more bird-friendly (glass buildings and automobiles are a much greater threat). In fact, PSE has had very few bird incidents. There are a couple of reasons for this: the towers are so tall that the blades are above most flight paths, and secondly the blades move so slow that most birds can avoid them. PSE is pleased with the results. "Energy generation in the first half of the year has been right at our expectations. In the Northwest, our peak tends to occur in the winter time, and it was especially nice that January and February were very productive months for the wind farm," Garratt says. And Hopkins Ridge not only has created power, it's created jobs and over a million dollars in tax revenue for the community. Besides the many jobs during the construction period, which peaked at around 200, Vestas has hired approximately 15 local people to run the operation and PSE has hired four more. "All are good paying family jobs," adds Garratt. This is just the start for PSE. The next wind farm, Wild Horse (also owned by PSE), is set for completion at the end of the year. With its 127 turbines producing 230 megawatts, together with Hopkins Ridge, PSE will meet its five percent renewable energy goal. Garratt doesn't understand why more utility companies don't own projects like Hopkins Ridge or Wild Horse but instead, continue to purchase wind power under wholesale agreements. But he understands going the ownerhip route requires some change and working things differently. "Owning it means that you have to have the right people to structure these types of arrangements. Contractually it's much different from a power purchase agreement. And you need all the right people to look at every single aspect of it. You need to know that what you're going to buy will really work." For their efforts, PSE got a little extra attention at the 2006 Wind Power Conference this spring. "We ended up winning the utility leadership award. We've also gotten a lot of media attention--from newspapers, radio, and television," says Garratt. "In some ways, I'm a little surprised about all the attention--especially on the ownership side. I just know it was absolutely the right decision for us."